There has been a lot of speculation about potential tenants for the Telephone Building since construction began in March on a major renovation project, which I wrote about in the Wall Street Journal. 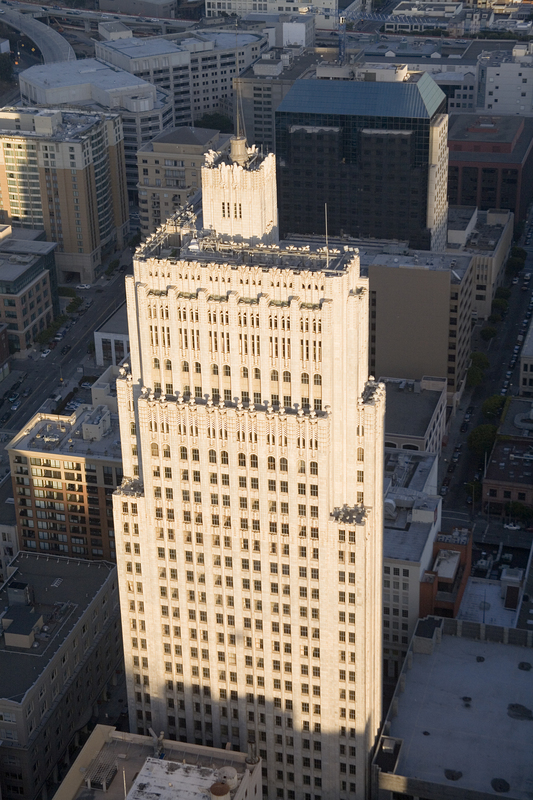 The $50 million-plus restoration and seismic retrofit of Timothy Pflueger’s iconic Jazz Age skyscraper, which has been vacant for about six years, is underway. Owners Wilson Meany Sullivan have also redubbed the building “140” – a nod to the nickname given the building by Pacific Telephone & Telegraph Co. An icon since it was completed in 1925, the skyscraper at 140 New Montgomery Street now even has its own very cool website, a promotion video and photo collage of architectural details. The base is now covered in scaffolding so it’s hard to peek inside and a construction crane lords over the building (see photo below.) The Timothy Pflueger Blog apologizes for not keeping readers au courant with all the news. 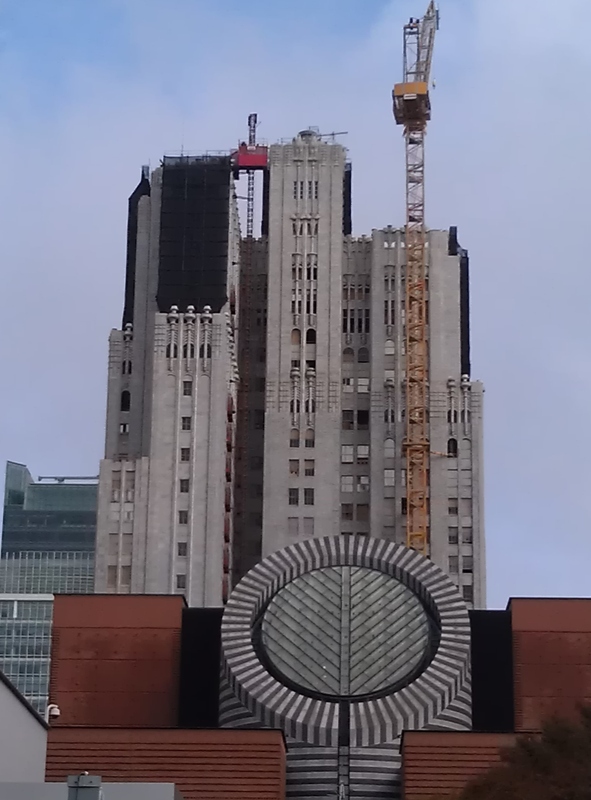 In addition, the San Francisco City Guides Downtown Deco tour will talk about the building from across the street, until the work is done. Since construction began, some major tenants have signed up. The biggest is Yelp Inc., which announced plans in May to move into the 26-story building, and lease eight floors, or 100,000 square feet, when the work is finished next year. Tthe San Francisco Chronicle reported in November that the popular Web-based review site’s lease is through 2021. Approximately 800 Yelpers will move in. Now, the two public spaces off the lobby have also been leased. In late October, the Chronicle reported that Mourad Lahlou, the owner and chef of Aziza, a well-regarded Moroccan restaurant in the Richmond District, has leased the larger space on the Minna side of the building. This restaurant will also feature the Michelin-rated chef’s take on Moroccan cuisine. Bar Agricole’s Thad Vogler has leased the smaller space. While both leases are exciting for local foodies, it is not clear what the news means in terms of architecture. A look at photos of the other locations operated by Lahlou and Vogler respectively has the Timothy Pflueger Blog worrying that both of these venues will go down the path of the trendy, industrial warehouse-chic look. Lahlou has hired Olle Lundberg, a San Francisco architect to design the new space, where, the Chronicle gushed, “exposed brick and concrete abound.” That’s not exactly how it was designed by architect Timothy Pflueger and his draftsmen, as one can see by the dark marble walls, detailed metal work, and the multi-colored plaster ceiling with Chinese motif in the stunning lobby. Many of the building’s interior office spaces are being gutted down to the brick walls to suit the needs of tech trendoids. To be fair, the last time I was in the ground floor space Lahlou is leasing, it was a museum for Pacific Telephone and did not seem to have any remarkable interior details, except for the 12-foot high windows. The architects had likely focused their attention on the public lobby space. Lundberg has a great opportunity to go beyond the tired industrial look and create a fabulous and exotic restaurant space evocative of the spirit of the 1920s. Fans of Pflueger and the building hope that he might seek to reference or incorporate Pflueger’s unique take on the Art Deco style, or even study some of his other works, such as the Moorish-inspired Alhambra Theatre on Polk Street, the high Art Deco Paramount in Oakland or his fabulous cocktail lounges from the 1930s, for inspiration. But Lahlou told the Chronicle’s blog, Inside Scoop: “I don’t want the space to be a shrine,” Lahlou said. “I want a good vibe, good music.” And if Lundberg’s previous (and I should add well-regarded) work is an example, his is an ultra clean-lined, almost antiseptic approach to modernism, but he is also known for liking to work with his hands. Perhaps there is more hope for the Whiteside Company, the proposed name for Vogler’s new location, which will be an all-day cafe, restaurant and bar. Vogler told “Inside Scoop” that he plans to serve up cocktails from the 19th and early 20th century, considered the Golden Age of the American cocktail, using recipes of one the city’s famous bartenders Bill Boothby. 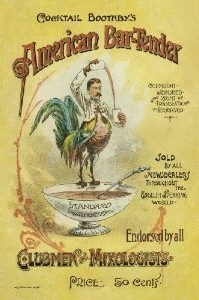 His bar book containing 400 recipes was reprinted by San Francisco’s Anchor Distilling Co. in 2009, with an excellent, well-researched foreward written by Fritz Maytag and David Burkhart of Anchor. Boothby was a bartender at the Palace Hotel, just down the block. There are even some examples, most in photographs only, of Pflueger’s stunning cocktail lounges that could serve as inspiration for Vogler’s new venue, should he or his architect decide to incorporate any references to Pflueger. My favorite is the former Patent Leather Lounge at the St. Francis Hotel. If you visit the registration area today you can see the stunning photos by Ansel Adams of the lounge which opened in 1939 with its unusual combination of black patent leather covered walls, carved Lucite ceiling fixtures and long serpentine-shaped bar. The interior of Pflueger’s Top of the Mark has been altered, but the Fairmont Hotel’s Cirque Room is the best extant example of a Pflueger cocktail lounge. While it is now slightly smaller in size, it retains its original circus-themed murals by local artist Esther Bruton, its original long curving bar, built-in banquettes and stunning mirrored columns. You can see Bruton’s circus murals below in a photo from a fabulous Art Deco Society of California party in 2008 for Art Deco San Francisco. It’s unlikely either of these two proposed venues at 140 will adopt any kind of Art Deco motif. It would be a lovely surprise if they did, and a nice homage to the building’s architecture. While they are at it, a signature drink named for Pflueger, a cocktail with his favorite spirit, rye, would also be nice.